A month ago, I posted an article about Hillary Clinton being the United States’ first Phantom President: http://thunderwingmatrix.tumblr.com/post/154834720947/hillary-clinton-our-phantom-president-2016-has As part of the article, I posted two mock-up Newsweek victory covers for Gary Johnson and Jill Stein. The existence of the Hillary Clinton victory magazine made me think of what the world would be like if she, or a different candidate won, so I decided to do some more mock-ups of alternate 2016 election winners. 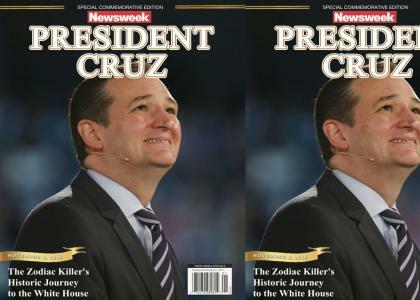 This is another version of the Ted Cruz mock-up that's not entirely serious, as it includes the "Ted Cruz Is The Zodiac Killer" meme that permeated throughout the 2016 election cycle. Enjoy! There are no comments, why don't you make the first?